Expanding on "New Questions in Mobile"
Benedict Evans recently wrote an insightful piece exploring new questions for the mobile industry. Among the 5 questions he brought up, I believe that the evolution of interaction models and messaging will end up being the most important. I don't have anything to add there as think Benedict's analysis here was excellent. However, I do think that three of his questions could benefit from deeper analysis. I also think that he may have missed a crucial question brought on by the scale of the mobile industry. This is a very popular question among some industry observers. Benedict's assertion here is that Google's control over the Android platform isn't guaranteed as the appeal of Google apps is limited and user engagement with Google Play is lower than that on iOS. As I argued in the AOSP Myth, this may be a weak argument. In a hyper-competitive industry, it is very difficult for a "Google-free" OEM to compete if 5-10 other OEMs are selling the same device, at the same price, with Google services. This is why China is a bit of a red herring -- there aren't really any devices sold in China with Google services. 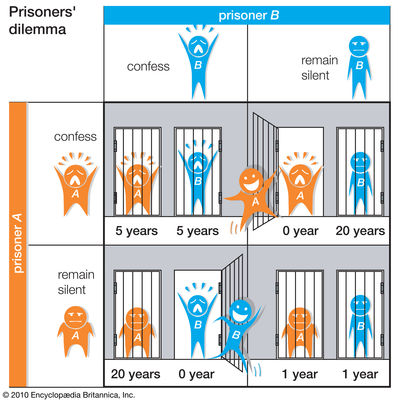 In effect, the best payoff for both prisoners will be achieved if both remain silent. But the best individual payoff requires each to betray the other. So the only rational course for any self-interested party (like profit-generating enterprises) is to betray each other. In the case of Android OEMs, it may benefit the whole industry (from a differentiation and profit standpoint) to fork Android and exclude Google services. But the threat of selling a non-competitive forked device, while others sell devices with Google services is too great for this to ever happen. Therefore, the only option left is to continue selling compatible, Google-licensed products. With this background, it should come as no surprise that Chinese OEMs (even those with customized firmware, like Xiaomi) have continued to rely on Google services outside China. Forking becomes even more problematic from an ecosystem viewpoint. As Visionmobile explains in "The Naked Android", Google has been pulling core APIs away from open source Android for years. Many of these APIs, including location services, billing, C2D messaging, syncing, etc., are now housed under the licensed Google Play Services umbrella. This means that any prospective "forker" will have to replicate these APIs and convince app developers to build customized variants of Android apps for their user base. Unfortunately, the install base of these prospective "forkers" never justifies the incremental cost for app developers, which automatically makes their business model unviable. This is why Xiaomi continues to emphasize that MIUI is a "compatible fork". Could we see more forks in the years ahead that are compatible with Google services? Of course, but that isn't necessarily against Google's interest. This isn't to say that Google would never merge Android and Chrome. That could certainly happen, but it will probably be driven by the evolution of interaction models and not the threat of forking. One assertion Benedict makes here is that Amazon and Facebook are motivated to insert themselves between users and platform owners, but haven't yet been able to. The first half of that statement is certainly accurate, but the second half isn't necessarily true. Benedict's analysis here is restricted to high profile failures like the Fire Phone and Facebook Home. While Amazon hasn't had much success here, Facebook has. Integrating Facebook login with Android and iOS apps has helped them collect usage data that is monetized through targeted app install ads. In other words, Facebook has in fact facilitated and monetized app discovery by inserting themselves between platform owners and users. App install ads are now a significant revenue driver for Facebook -- a revenue opportunity that Google is still trying to capture. 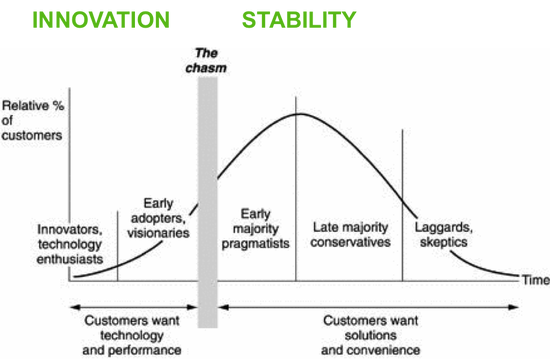 Innovators and early adopters are normally drawn to novel technologies, but these products eventually "fall into the chasm" unless they evolve to solve real problems for mainstream customers. For example, smartphones evolved from being fancy, touchscreen phones to full-fledged pocketable computing devices. At this moment, wearables and smartwatches are at the far left hand side of this curve. Early consumer interest in these devices is mostly driven by the technology, the companies behind these products and specialized use cases. What is still unclear is the primary benefits of these products for the "non-tech savvy" or their potential to become full-fledged computing platforms. This is why the list of questions for wearables is much longer than this one. As I wrote in "Imagining The Next Big Platform", I certainly agree that devices like Oculus have much more potential to make much more fundamental changes to the basic touch-based interaction model. But this is still many years away for mainstream users (probably even more to the left on the diffusion chart). Benedict did touch upon scale in his post, but I think he missed a crucial question here. There are close to 2 billion smartphone users today and that will grow to roughly 4 billion over the next few years. However, the purchasing power of these users will be far lower than that of the existing user base, i.e. they will probably buy $25-$50 devices and not $600 or even $200 devices. How do you monetize a user who can only afford to pay $25-$50 for a phone? At these price points, hardware margins will be razor thin, so companies will have to rely on a services-based monetization model. But even existing monetization models for apps and services will need to evolve to capture value from these users. These users are unlikely to have credit cards and even with carrier billing, their purchasing power may not be strong enough for in-app purchases to be meaningful. Advertising could add some revenue, but how much will advertisers pay to reach a user at these income levels? Therefore, technology companies will have to explore novel business models that purely rely on vast user numbers to profit from mobile scale. Discovering these business models over the coming years will be the most exciting part of studying this industry.